Your email address is secure and is never shared. There’s a chance that your current billing practices are draining your wallet and creating unnecessary stress for you, your staff, and your patients. 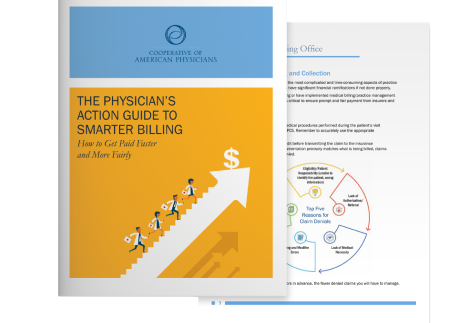 Our newest practice management resource, The Physician’s Action Guide to Smarter Billing, can help you and your staff put processes in place so you’re paid in a timely and fair manner. The Cooperative of American Physicians (CAP) provides medical professional liability coverage to nearly 12,000 of California’s best physicians as well as a wide range of free resources and services to help avoid lawsuits and enhance the running of their practices. CAP members receive medical liability protection from the Mutual Protection Trust (MPT). Since 2006, MPT has earned A.M. Best Company′s A+ (Superior) rating, demonstrating MPT′s financial strength and its ability to meet ongoing coverage and contractual obligations.